Pittsburgh will calculate the environmental and economic impacts of new infrastructure projects using Siemens smart city tool, the company announced. It will use Siemens City Performance Tool to gauge the impact of its proposed energy districts, an initiative to build on-site power as part of the city’s ONEPGH Resilience Strategy. Pittsburgh’s ONEPGH resilience strategy, developed by the City of Pittsburgh in conjunction with 100RC, highlights the city’s resilience framework, p4, focusing on People, Place, Planet and Performance. Pittsburgh has identified challenges within each of these key areas and identified potential partner organizations that have the capacity to support the city in delivering on these goals. Siemens is a 100RC platform partner. The Siemens smart city tool is also in use by other cities, such as New Bedford, MA and Minneapolis, MN, San Francisco, CA and Copenhagen, Denmark. 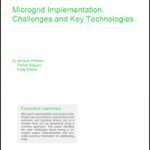 See related story on Microgrid Knowledge: Will America’s Steel City Build the First Grid of Microgrids?